J. M. Winn. Variational Message Passing and its Applications. Wiegerinck, W. Variational approximations between mean field theory and the junction tree algorithm , UAI-2000. M. J. Wainwright, and M. I. Jordan. Graphical models, exponential families, and variational inference. UC Berkeley, Dept. of Statistics, Technical Report 649. September, 2003.
structures, sample sizes and queries. This is joint work with Tim Van Allen, Ajit Singh and Peter Hooper. typically to return the most likely class label for each specified instance. in common situations where the given BN-structure is incorrect. In Fourteenth Inter. Conf. 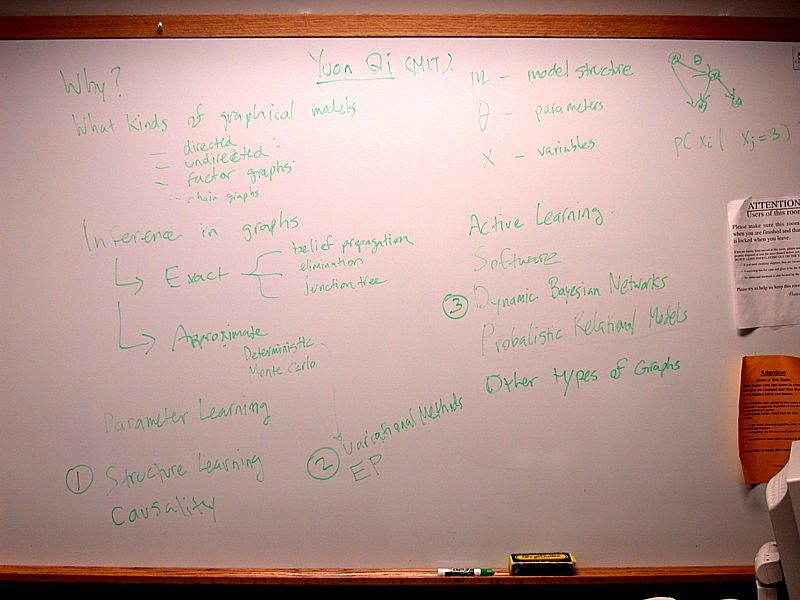 on Machine Learning (ICML). 1997. Networks. Machine Learning, 50:95-126, 2003. PostScript, PDF. Information Processing Systems conference (NIPS), 2000. Conference on Uncertainty on Artificial Intelligence. They cover the bulk of causality, which is estimating causal effects from a structure given in advance. David Edwards (2000): "Causal Inference", this is Chapter 8 (pp. 219-243) of his book "Introduction to Graphical Modelling" (Springer, 2nd ed). Kernel Conditional Random Fields: Representation, Clique Selection, and Semi-Supervised Learning.